Students learned how to fillet a salmon during a Sitka Kitch class held Tuesday, Aug. 7, in conjunction with the Sitka Seafood Festival. The class took place at the Sitka Kitch community rental commercial kitchen (505 Sawmill Creek Road, inside First Presbyterian Church). Renée Jakaitis Trafton, owner/chef at Beak Restaurant, taught the class. Not only did she show students how to get more meat in their fillets, but she also showed them how to pick pinbones and skin the fillet (for those wanting salmon skins to use for arts and crafts. 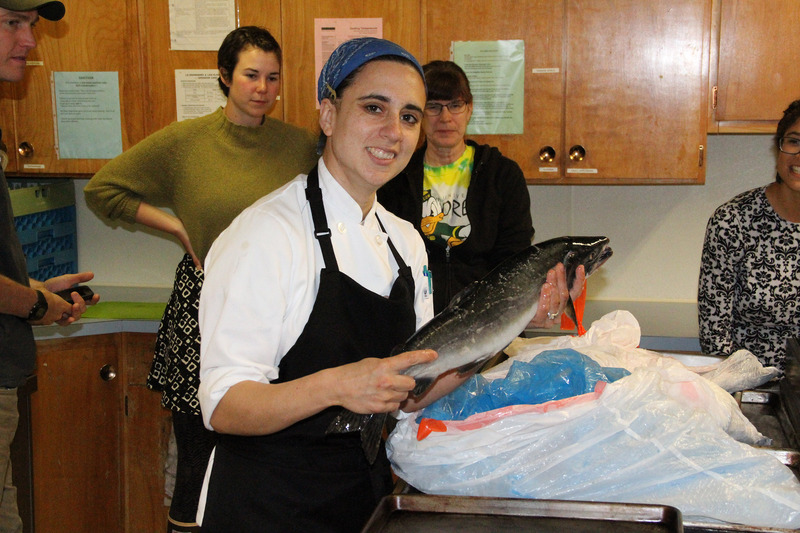 The salmon used in the class were hatchery kings donated from the Northern Southeast Regional Aquaculture Association’s (NSRAA’s) Medvejie Hatchery, and each student in this class received a fillet knife to take home. The next Sitka Kitch class is a cooking with seaweed class held from 6-8 p.m. on Tuesday, Aug. 14, as part of the Sitka Mermaid Festival. This class will be taught by Sitka Mermaid Festival coordinator Amelia Mosher and Hope Merritt of Gimbal Botanicals. They are still finalizing their plans for the class, but they plan to make something using agar agar (a red seaweed derivative used for jellies and other products). They also could teach a no-bake cheesecake using seaweed and seaweed smoothies. The cooking with seaweed class costs $27.50, plus a supply/food fee split among the students. The class size is limited, so register early to guarantee your spot in the class. The registration deadline is 11:55 p.m. on Saturday, Aug. 11. Register online at http://sitkakitch.eventsmart.com (click on class title) using a debit or credit card or PayPal account, or call Claire, Chandler or Clarice at Sitka Conservation Society (747-7509) to arrange the drop-off of a cash or check payment. For more information, contact Amelia Mosher at (707) 672-2909, Jasmine Shaw at 747-9440, Claire Sanchez at 747-7509 or email sitkakitch@sitkawild.org. A slideshow of scenes from the how to fillet a salmon class is posted below. Sitkans love their seafood, and the Sitka Kitch community rental commercial kitchen is offering a great class in conjunction with the Sitka Seafood Festival. From 6-8 p.m. on Tuesday, Aug. 7, at the Sitka Kitch (505 Sawmill Creek Road, inside First Presbyterian Church), local chef Renée Jakaitis Trafton of Beak Restaurant will teach students how to fillet a salmon. This includes lessons on how to remove the pinbones from the salmon and how to remove the skin. The Sitka Seafood Festival is providing fish for the class, so there should be no food/supply fee. The class costs $30, which includes a new fillet knife for every student. The registration deadline is 11:55 p.m. on Saturday, Aug. 4. Registration is capped at 10 students so sign up early to secure your space in this class. Register online here using a debit or credit card or PayPal account, or call Claire, Chandler or Clarice at Sitka Conservation Society (747-7509) to arrange the drop-off of a cash or check payment. For more information, contact Jasmine Shaw at 747-9440, Claire Sanchez at 747-7509 or email sitkakitch@sitkawild.org.